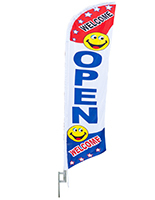 This Open Feather Flag is Ideal for Businesses of All Types! This Signage is In Stock and Ready to Ship! This Open Feather Flag is Brightly Colored! 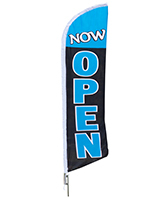 This open feather flag that is meant for outdoor use is your best option to business message banner needs. This highly noticeable signage is meant to attract prospective customers and inform them of the location and availability of an establishment. 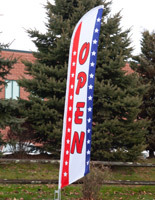 This open feather flag is tailored so the message is constantly visible whether it is windy or not! 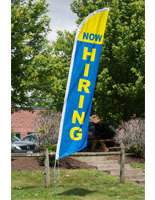 This economy outdoor banner has a pre-printed business message which makes it easy for businesses as they do not need to design a custom graphic. 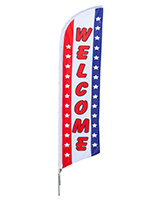 This feather shaped pennant, open feather flag that ships unassembled has a 4 piece aluminum pole that goes together with ease. 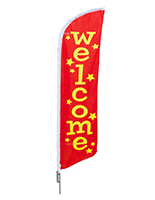 A pocket sown into the banner allows a single person to slide the pennant on the pole with ease. 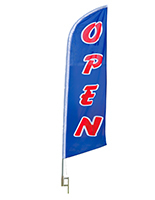 This open feather flag can be used in front of any establishment to ensure customers are aware of the in-business hours. These blade shaped pennants are made of a durable poly knit material. 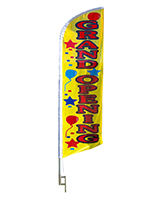 This 14' banner does not include a custom nylon carrying case which is a contributing factor to the affordability. 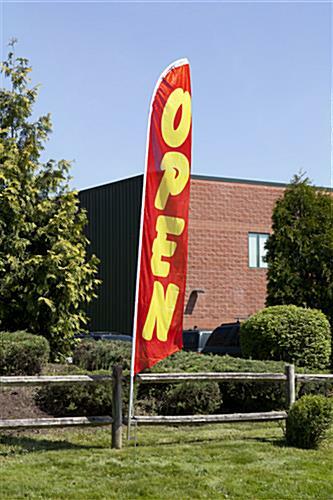 This open feather flag is 14 feet tall so whether a customer is driving by or walking on foot, this banner cannot be missed. 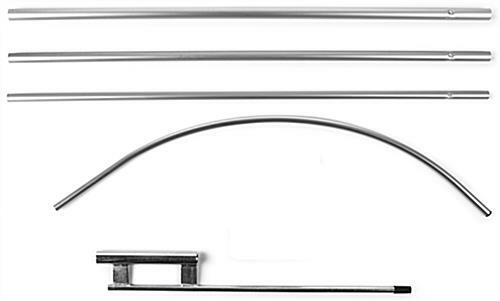 This display includes a metal ground spike for stable installation into the grass or dirt.